Treat case - I'll take one of each! 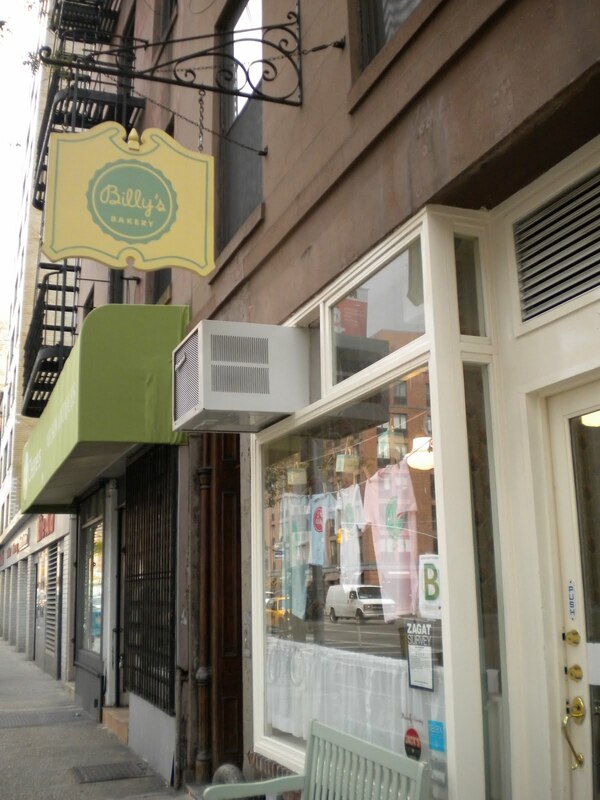 Near our friends' apartment in Chelsea is a Billy's Bakery, specializing in - you guessed it - cupcakes! 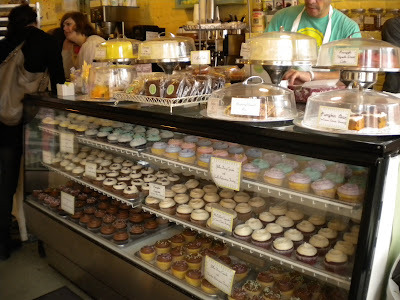 We tried the yellow cake with chocolate buttercream, the red velvet with cream cheese frosting and the chocolate cake with vanilla buttercream. 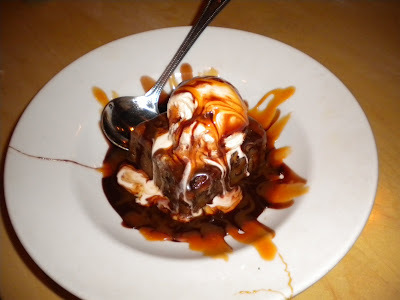 I'm drooling at the memory! If you are anywhere near one of their three NYC locations, this is a definite snack stop. We tried to go twice just after closing - we were up much later than our usual 9 PM bedtime while in NY - so finally enjoying their delicious cakes was truly satisfying. Putting the icing on the cake! 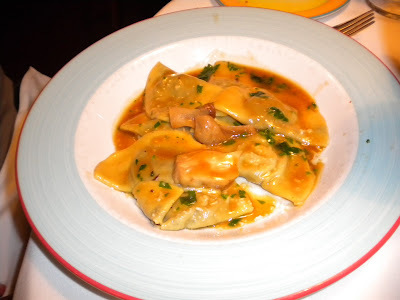 I'm nearing the end of the belated New York posts (one more!) 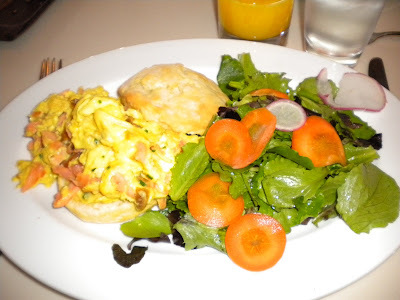 and then we'll go to a few cooking posts and some more recent Atlanta and Charlotte eats. One day we bought half price tickets to In The Heights - at that time starring Jordin Sparks - and had some tasty dim sum (sorry no photos!) in Chinatown. Although the dim sum was tasty, it was not really better than what we have in Atlanta and definitely not good enough to make me want to wait an hour again! We did get to see my cousin Jason (yay) so that was fun and afterwards we walked through Washington Square Park, always interesting to see the street performers. 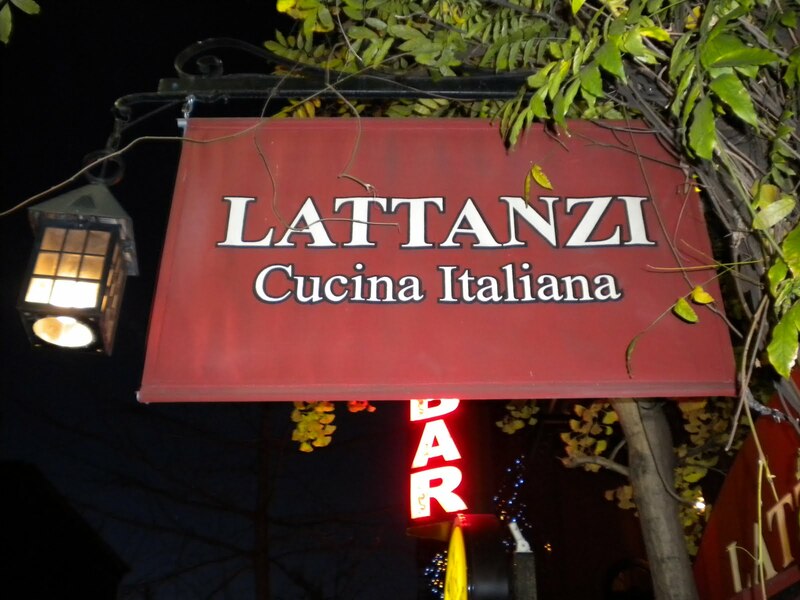 Later, before the show we headed to Lattanzi Italian Ristorante for some Italian goodness. The restaurant is downstairs, somewhat underground in the theater district. The ambiance is nice, not too loud with significant lighting and chandeliers. 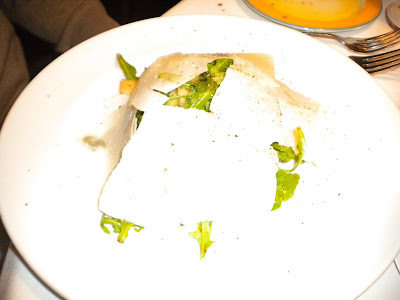 I enjoyed our meal but was a bit disappointed overall. Based on the reviews it sounded like this place would be outstanding and very memorable. 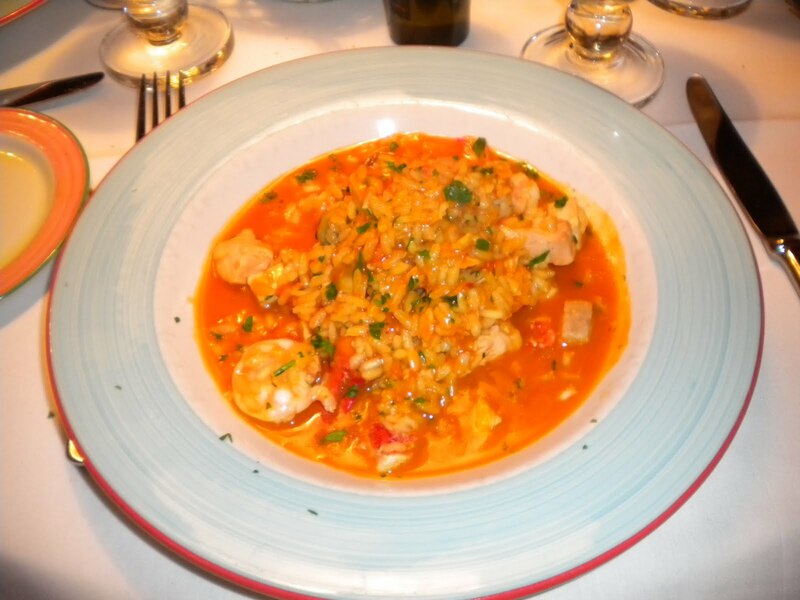 I can't really remember much about the food so that is not a good sign! In any event, we enjoyed another meal with our wonderful hosts and had a great time at the show! 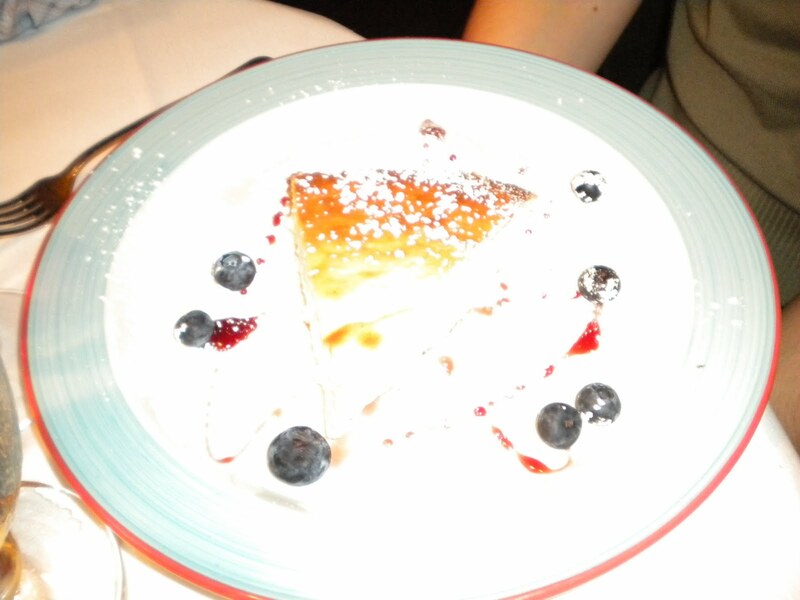 Light cheesecake - with too much light!! 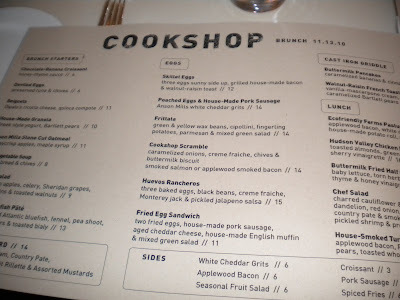 During our stay in New York, we enjoyed a tasty brunch at Cookshop in Chelsea with our fabulous hosts. 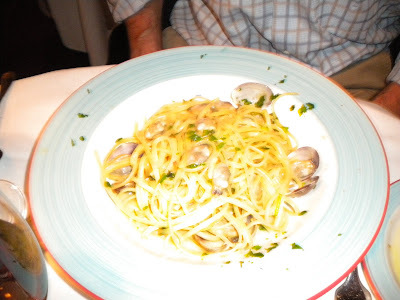 Even better, we were able to walk to the restaurant from their apartment. After brunch we checked out the High Line Trail and Chelsea Market where I found all sorts of holiday goodies to take back. What fun! The butcher board was my favorite part of the meal. 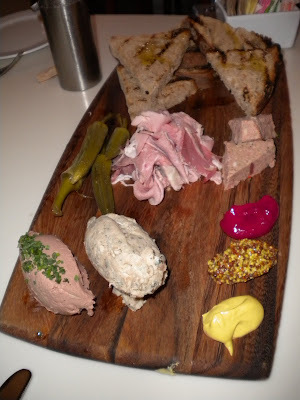 It included country pate, liver mousse, Virginia ham, rabbit rillette and assorted mustards - delicious with warm toasty bread on the side. 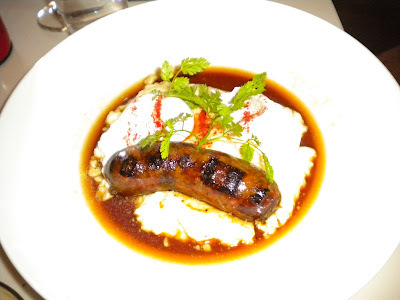 Poached eggs & housemade pork sausage. 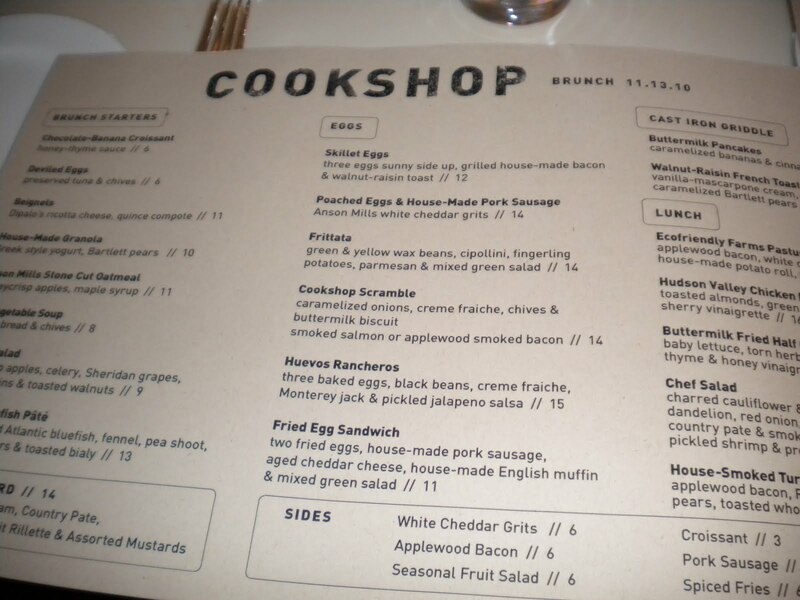 Cookshop is big on the pig! Cookshop scramble with smoked salmon. 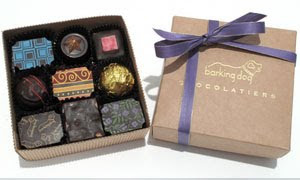 Barking Dog Chocolatiers is a non-profit small artisinal chocolate company founded by husband and wife team Joal Fischer and Deborah Langsam. The chocolates are handmade and all profits are donated to local charities including Supportworks (founded by Fischer), Friendship Trays and NC MedAssist. 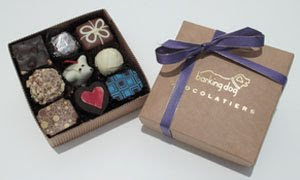 In addition to working on a volunteer basis for these worthy causes, the chocolates are top notch, creative and addictive! I was lucky enough to be provided with samples of the new rare breeds line as well as the classics. In addition, because the owners are also personal friends of my family (I was actually the flower girl in their wedding many years ago! ), I've also tasted the St. Bernard collection and the chocolate Pop Rocks treats. Linzer truffle: raspberry pate de fruit over a layer of spiced milk chocolate hazelnut ganache. Very unique and tasty. 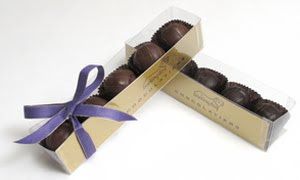 Earl Grey tea: dark chocolate ganache infused with Earl Grey tea with a beautiful patter on top. "hot chocolate": truffle with pineapple ganache infused with a hint of habenero. 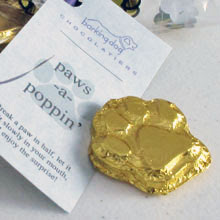 Paws-a-poppin - Dark chocolate with Pop Rocks candy inside - a deliciously surprising party in your mouth. Also available in heart shapes. Really want to impress? 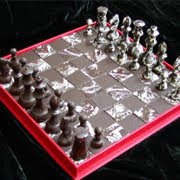 Have the chocolatiers at Barking Dog create an all chocolate chess set. Also available, a variety of barks. 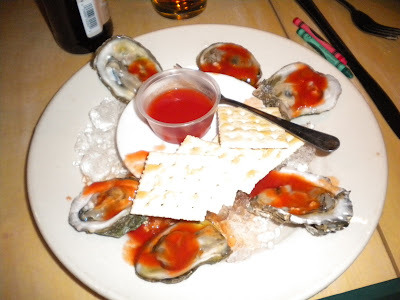 These are SO GOOD. My favorite: the dark pecan-cherry. To order, call 704-333-1595 between 9 AM and 5 PM EST or email using the form here. 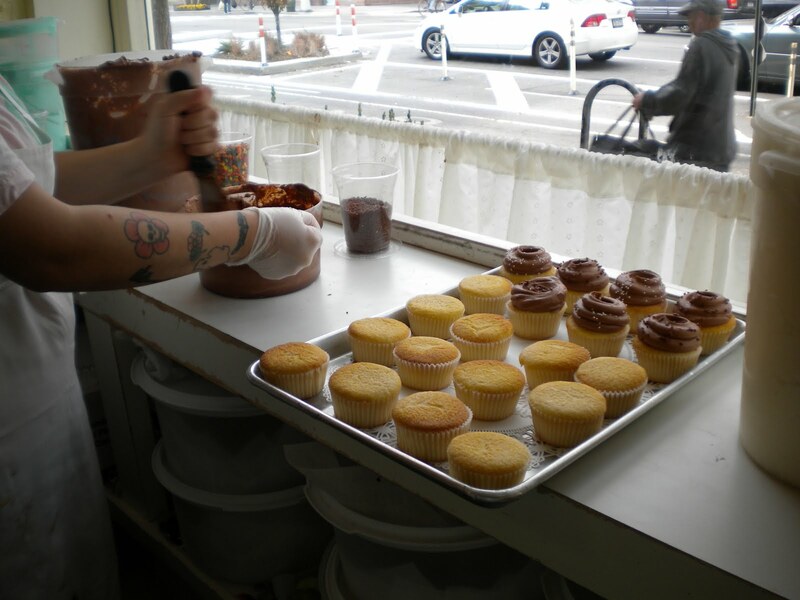 In addition to all the tasty items mentioned, there are a few more delicious treats available and favors and custom flavors can also be created. With our wedding officiant, June, outside the restaurant. 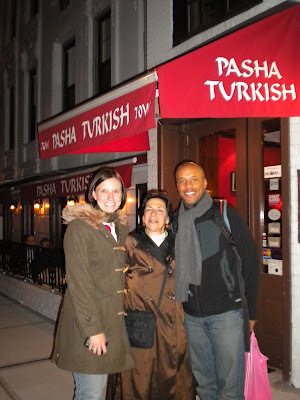 One evening in New York we dined at Pasha, a warm, inviting Turkish restaurant on the upper West side. On the way there we saw Ben Stiller filming a movie near Central Park. The crew was shushing everyone, which we found hilarious - telling people walking down the street in NYC to be quiet! Luckily we found the restaurant with no problem, and after a LONG walking day - we calculated about 9 miles total, we really enjoyed taking a load off and having dinner with June, a family friend who will officiate at our wedding in April. The food was very enjoyable, especially the dips and olives and Calvin's lamb dish - very tasty. 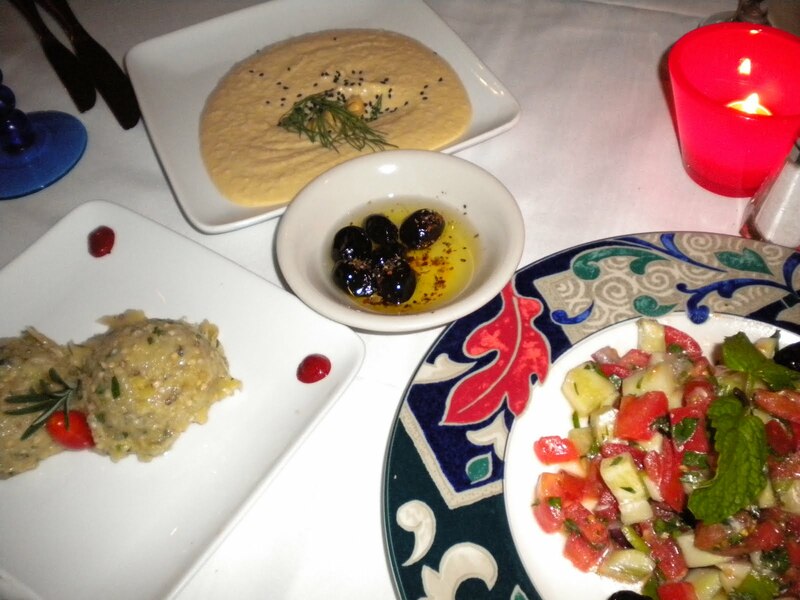 Grilled eggplant dip, hummus and salad. 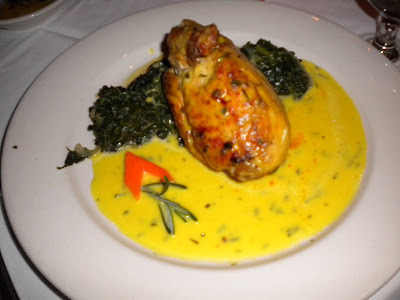 Chicken breast stuffed with rice, pistachios and currants. 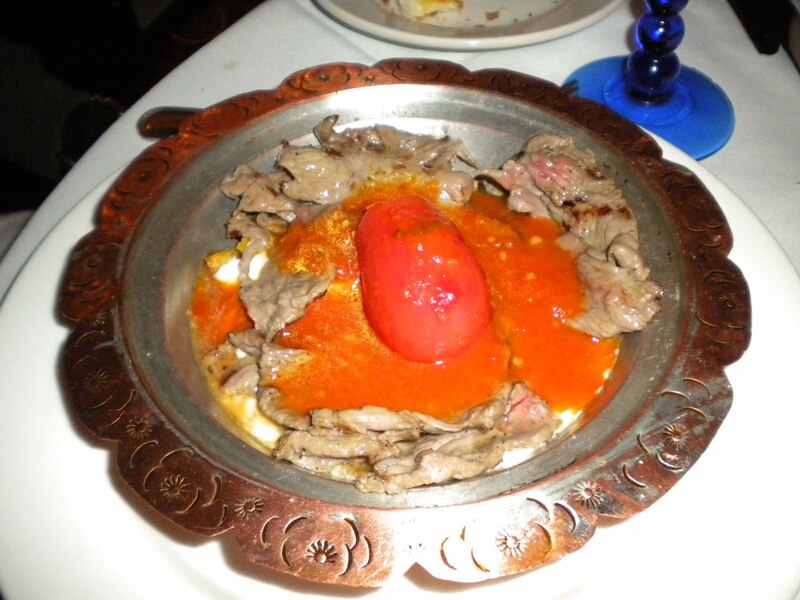 Lamb slices with tomato sauce. 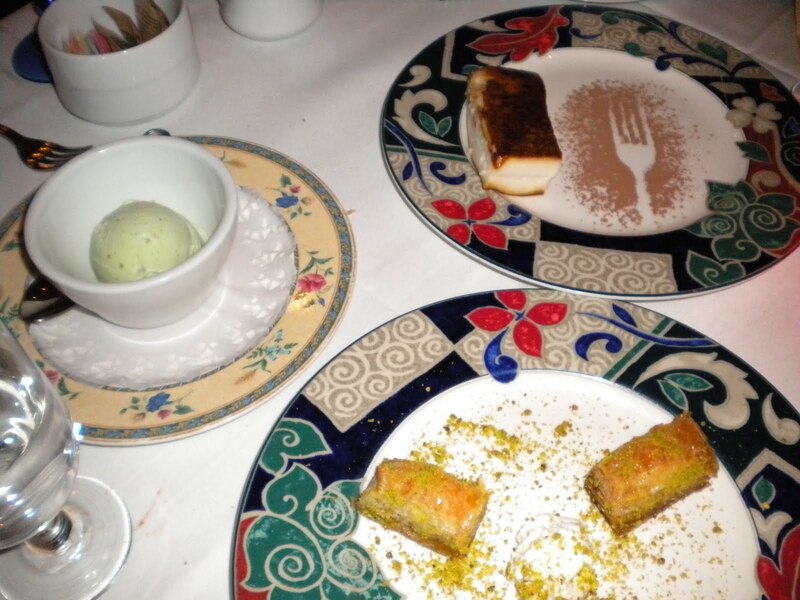 Ice cream, baklava and milk pudding rounded out the meal. 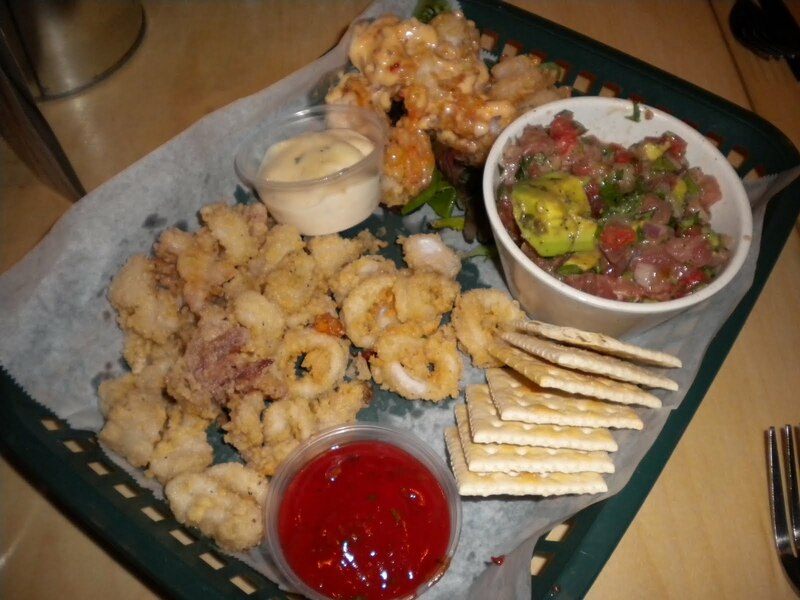 Platter of Calamari, ahi tuna ceviche and bang bang shrimp. I was invited to come try Tin Can Fish House & Oyster Bar, a fairly new restaurant in Sandy Springs. As I don't get OTP very often, this was a bit of a trek , but still not too far all things considered. 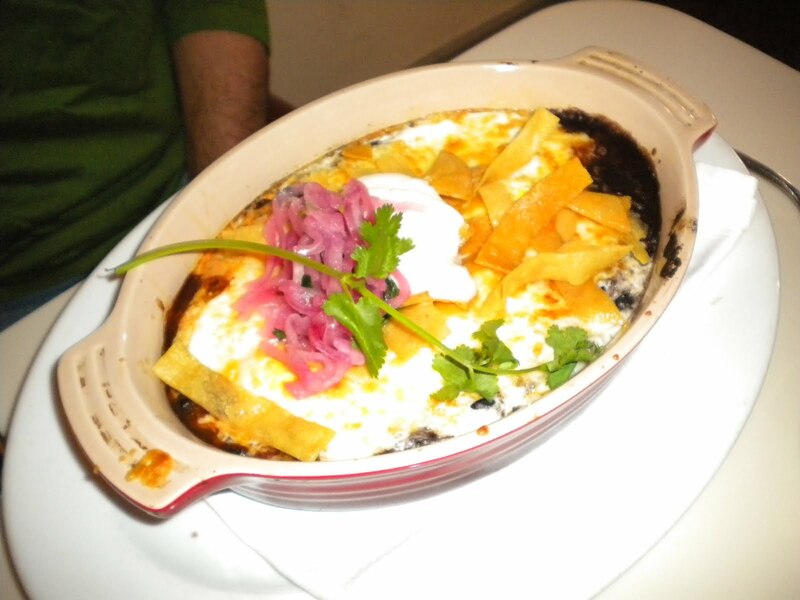 Although the restaurant sits in a shopping center, it does a good job of getting that neighborhood feel. 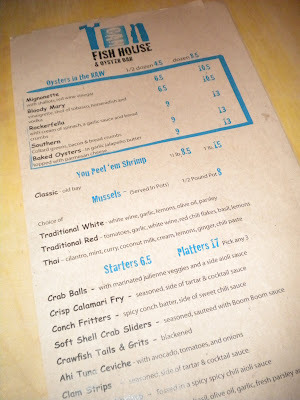 I could see folks who live nearby coming here frequently and they also do a good job making it family-friendly. 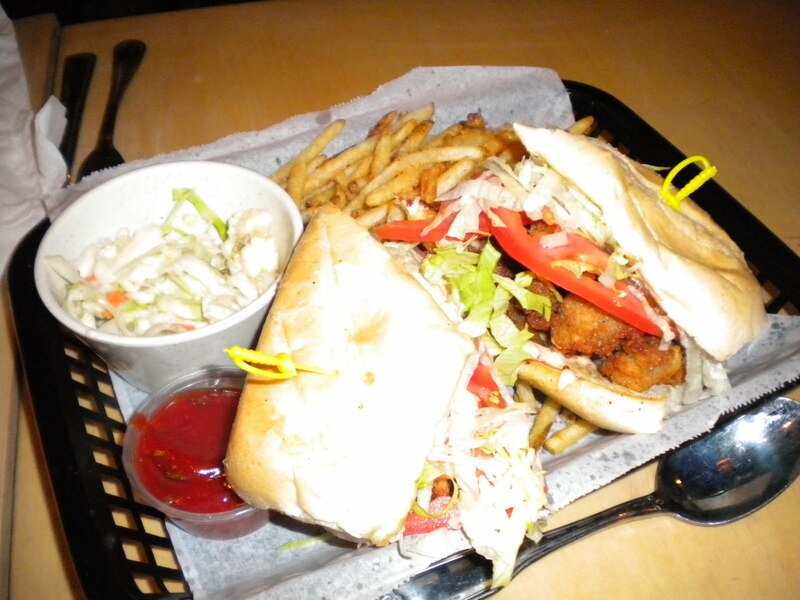 Kids can draw on huge chalkboards on the front side of the restaurant, providing a fun activity for the younger set. 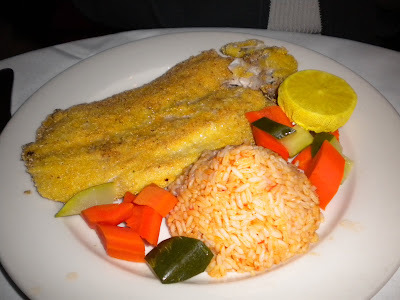 We tried a variety of items from the menu, my favorite being the horseradish-crusted grouper. 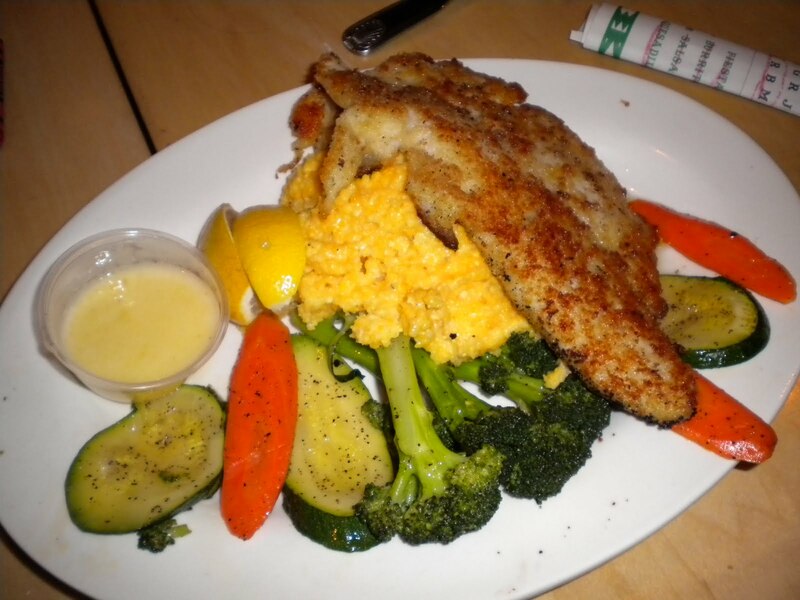 For my sides I chose cheese grits (yum) and very good steamed vegetables. On the appetizer platter we ordered, the calamari and bang bang shrimp were average although the ceviche a nice touch. 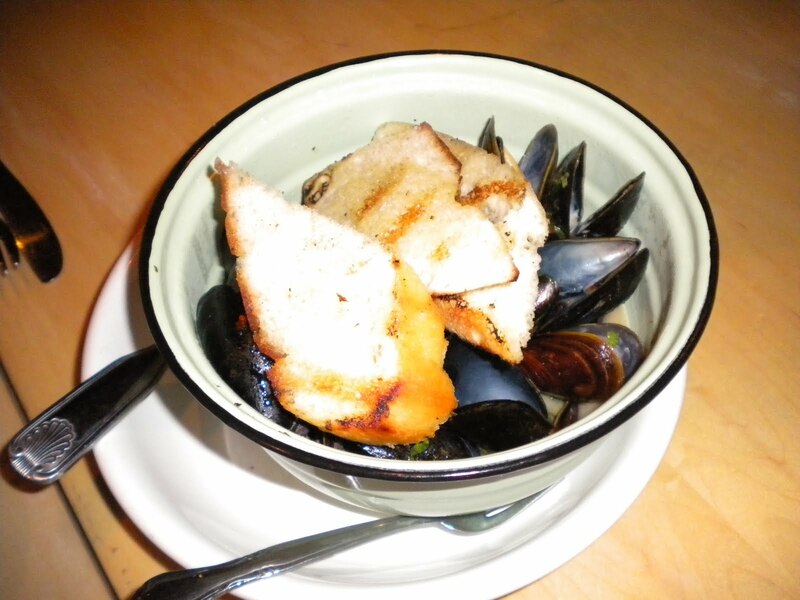 The mussels were pretty good and I enjoyed the raw oysters despite the grit in a couple of them. 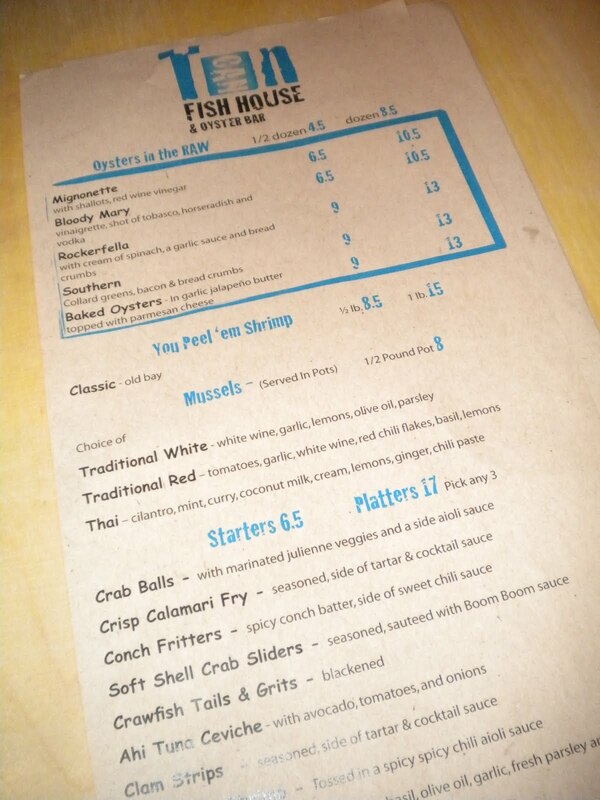 Other than the grouper, the seafood was nothing special, but I do appreciate what Tin Can is trying to do - service was attentive and the neighborhood feel is something not to be taken for granted. Horseradish crusted grouper with veggies and cheese grits - my favorite dish of the night. Crisp fried laughing bird shrimp with confited shrimp salad, ginger, chile, meyer lemon vinaigrette. I was recently invited to a dinner event sponsored by Mirassou Winery and held at Woodfire Grill. 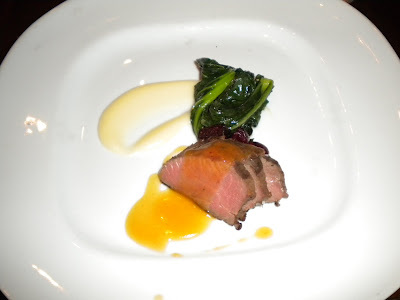 This was a wonderful event and gave me the opportunity to try famous Top Chef Kevin Gillespie's creative cooking. 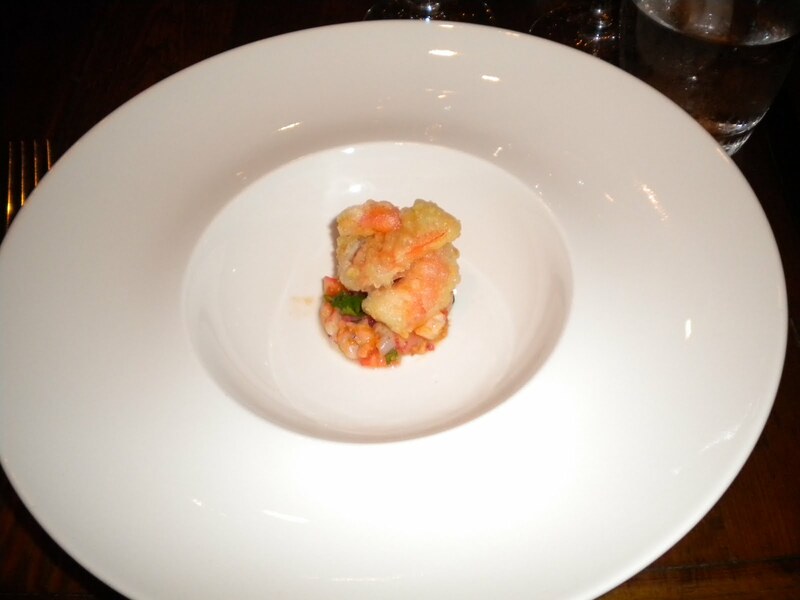 The first course, shrimp paired with the winery's 2008 Sauvignon Blanc, was my favorite. 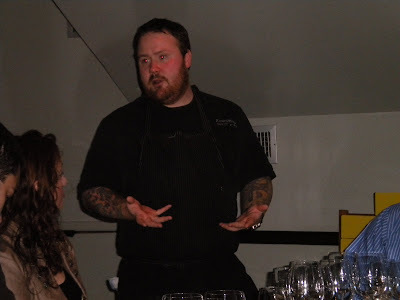 The neat thing about the dinner was that the winery asked Chef Gillespie to create special dishes to go with 6 different wines. Before tasting the pairings, Chef came to talk with us about his choices. We also dined with and heard from David Mirassou, who is from the Mirassou family's 6th generation and knows lots about wine. 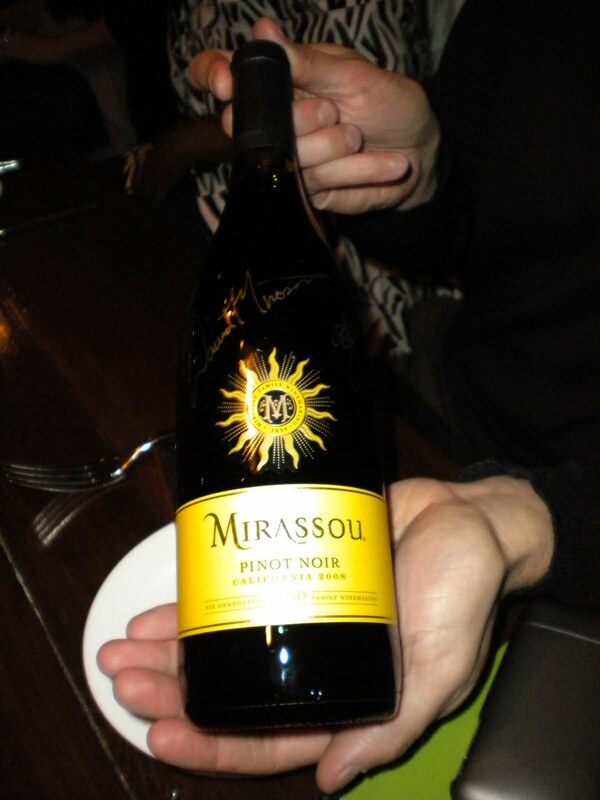 Mirassou is one of America's oldest winemakers, going back 6 generations to France. During the gold rush of the 1800's the family originally immigrated to the US, bringing grape vines with them in their suitcases! 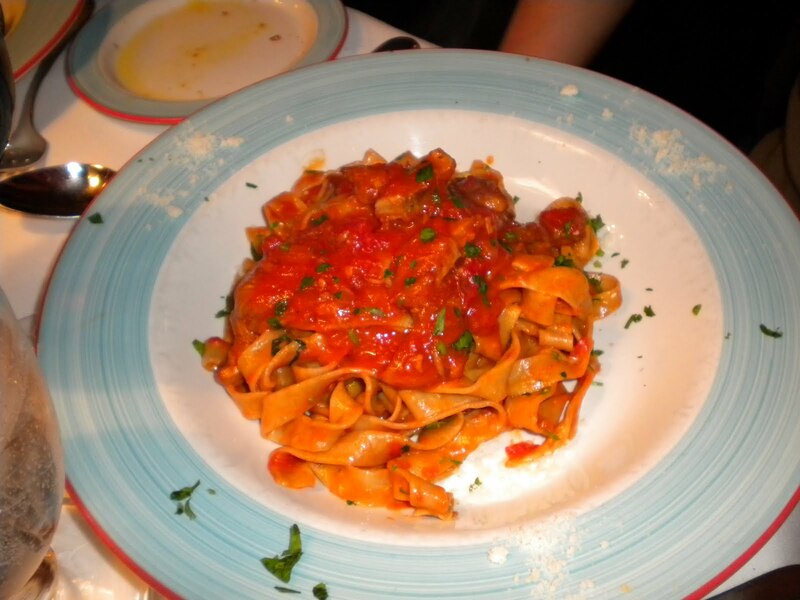 Hope you enjoy the photos. We had lots of glasses. Woodfire's Chef Kevin Gillespie explains how each dish pairs with each wine. 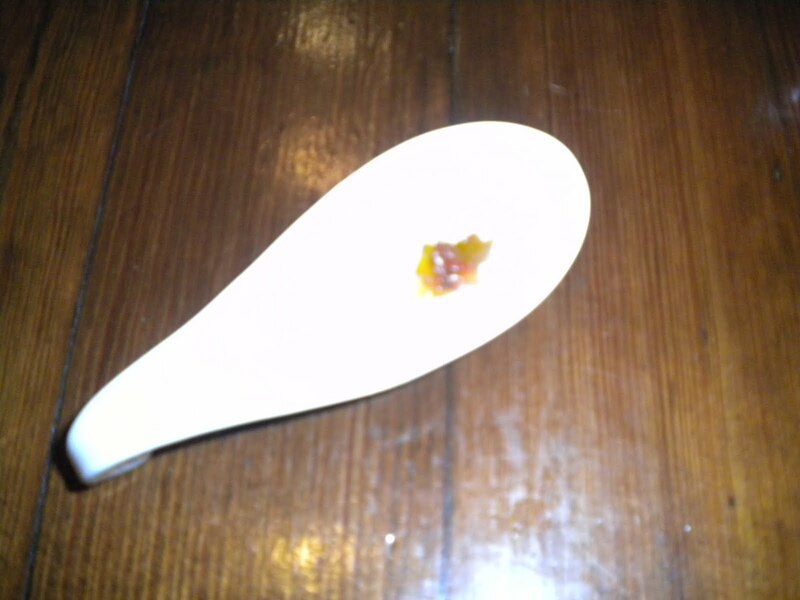 Amuse of charred local peach, spicy pepperonata, pecorino di puglia. The Mirassou label. 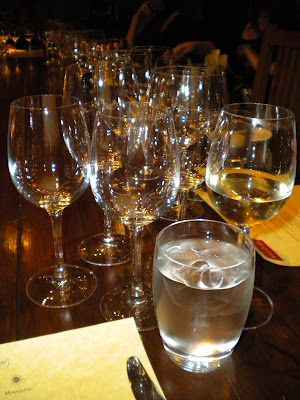 Overall I really enjoyed the wines, especially the Sauvignon Blanc and the Pinot Noir. These wines can be found at your local grocery store and are reasonably priced. 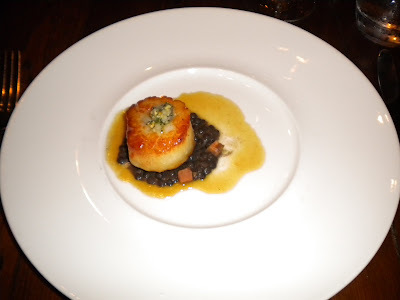 Pan roased day boat scallop, sweet potatoes, winter squash, black lentils, pear and cashew salad, green chile jus, paired with 2009 Pinot Grigio. 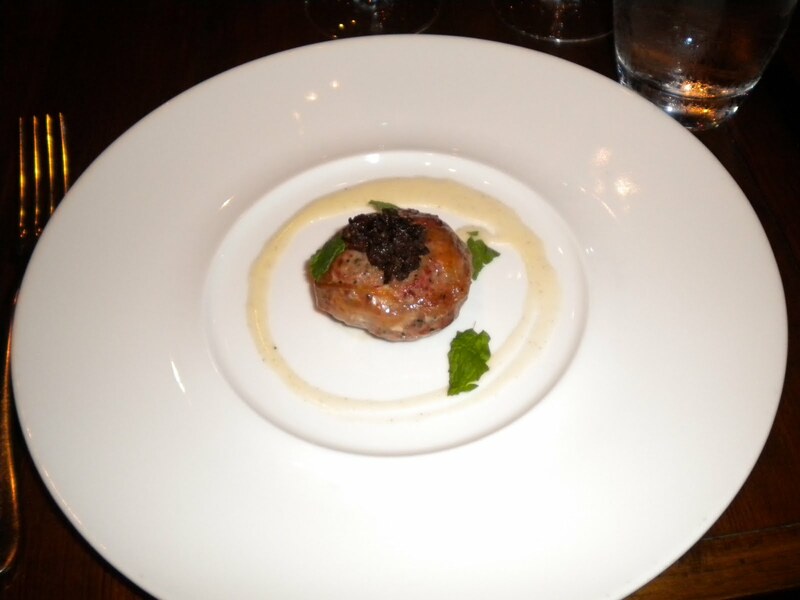 Border springs lamb crepinette (sausage), cured olive tapenade, lemon cream mint, paired with 2008 Pinot Noir, the winery's best selling wine. 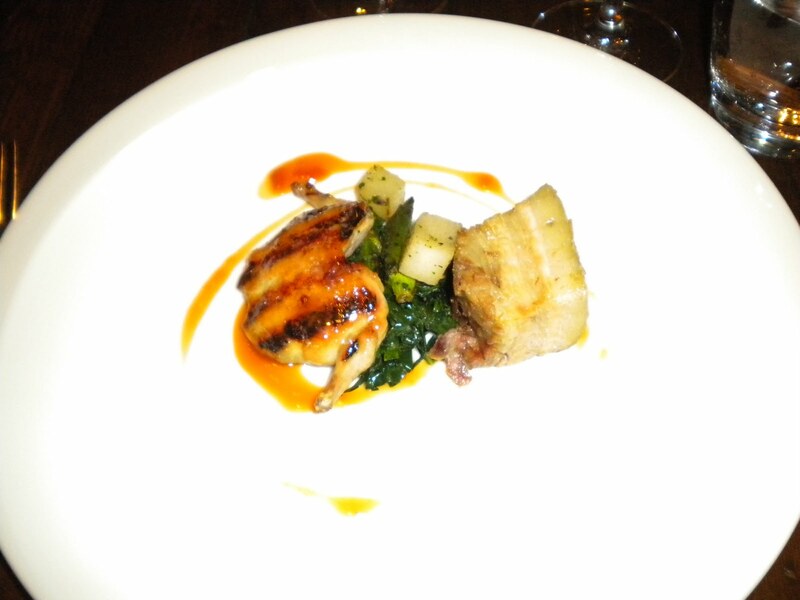 Wood grilled local bob quail and smoked pork belly, roasted local okra, hakurei turnips, lacinato kale, chicken jus, paired with 2008 Merlot. Wood grilled border springs lamb leg, roasted pac choi, mixed young beets, parsnip puree, cardamom lamb jus, paired with 2008 Cabernet Sauvignon. 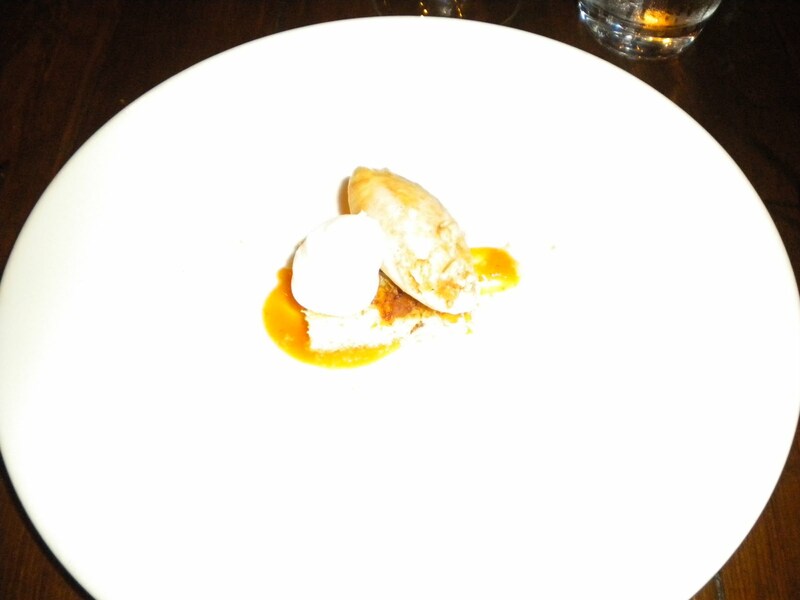 Peach streusel cake, almond mascarpone mousse, peach puree, peach ice cream, feulletine crumble, paired with 2009 Riesling.